Making chai-flavored drinks for your restaurant or coffee shop is quick and easy with this DaVinci Gourmet chai tea concentrate! DaVinci Gourmet products are made from pure cane sugar to complement your beverages without overpowering them or being too sweet. This flavorful concentrate contains caffeine and features a sweet and spicy combination of flavors. It is made with black tea concentrate, honey, and natural chai flavors including cinnamon and cardamom. Significantly reduce prep time and enhance your drink menu with popular drinks with this chai tea concentrate! To make a chai iced tea, simply mix this concentrate with water and pour over ice. It's that easy! You can also blend this concentrate with steamed milk to create chai lattes. 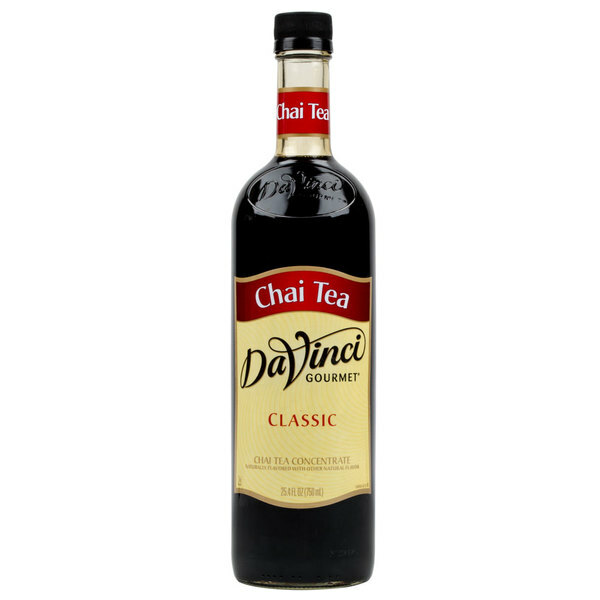 Sold in gourmet coffee shops, specialty food stores, food service outlets, and grocery stores, DaVinci Gourmet products, like this chai tea concentrate, have a long history of commitment to quality and superior taste. I was pleasantly surprised how good this chai tea concentrate is. It has a great chai spice flavor and is super easy to make just adding a couple pumps. This Chai tea concentrate is much better than the powders and much easier to use. It tastes like you just brewed chai, it doesn't have any artificial taste or after taste to it. Very happy with it! I got into a spiced chai tea latte craze after having one for the first time, and this almost filled the void those expensive drinks left in my stomach. Don't get me wrong, this flavor's REALLY good, and I highly recommend it, but if you're looking for that signature peppery "spiced" taste, you're gonna have to add a few spices in with it. It's potent, but I think it tends not to last forever... Maybe chai's a sensitive flavor, because after a few months this flavor went from stellar & decadent to having an odd rubbery after-taste for me. So you need to REALLY love your chai, GET THIS, but be ready to use it often before it seemingly expires. A few spices like cloves, ginger and a hint of cinnamon mixed in with it totally bring it back to life though, and work beautifully when it's fresher. Davinci Chai Tea concentrate syrup is a naturally delicious way to please your taste buds! This product allows the flexibility to make the chai tea flavor as strong as you prefer. The flavor is deep and rich, with no bitter or odd aftertaste. I use this syrup in both cow's milk as well as almond milk, and it mixes well with both. This makes a delicious beverage either hot or cold, and can be used to flavor baked goods. We've experimented with four or five Chai Tea concentrates, and the DaVinci brand comes out on top every time. Both us (the owners) and our customers prefer it, and it looks like we'll be serving it for a long time. I really can not put this stuff down every day. Believe it or not, but I think this is easily the best Chai Tea concentrate that I have ever used. It is perfect for us. I love chai tea, but I do not have a brewer in my apartment. I love the cha tea concentrate as its easy to dilute and make a great tasting and soothing cup of chai tea in seconds. A nice easy way to make chai lattes without brewing. The chai concentrate dilutes well and tastes great. A nice find that saves us time and money. 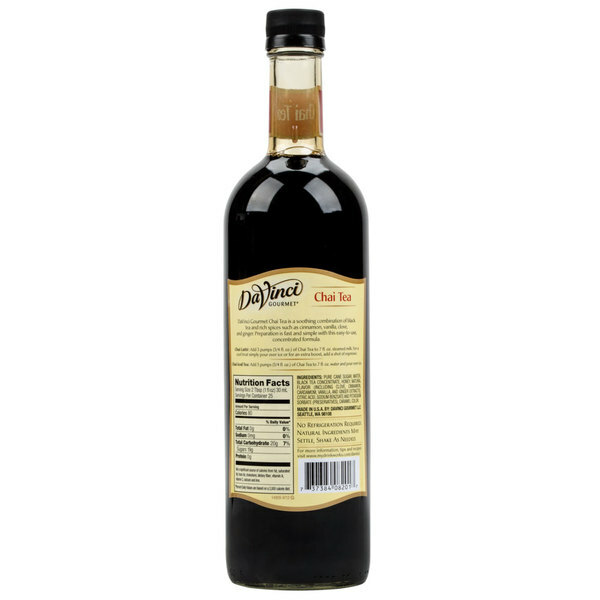 This DaVinci Gourmet Chai Tea Flavoring Syrup is very popular with our customers in our cafe. Very easy to use with the add on pumps and display perfectly with the add on holders. The DaVinci Gourmet Chai Tea Concentrate allows you to make great tasting Chai Tea quickly. It has a great flavor and is inexpensive. I would recommend this. The concentrate tastes fine but it's not as good as the cartons of chai. Some customers decide not to order a chai when they see that we use this concentrate. DaVinci more like DaBomb Chai Tea Concentrate! This stuff is great, the chai flavor is not over powering like other brands. Would recommend this to everyone. Very easy to use and creates a good tasting drink. I prefer this to the other brands offered on the site, and will purchase again. OMG, I love this! It mixes well and it's amazing with ginger liqueur. Use this as a back bar chai tea or as a unique drink layer of flavor. I can't wait for fall cocktails!! Davinci chai tea concentrate has a strong chai tea flavor. It tastes just like chai tea but a little bit sweeter. I have to add simple syrup to make it sweeter. This is our favorite Chai Tea Concentrate! Customers comment on this flavor all the time, because the flavor is amazing and the aroma is intoxicating! Only Chai syrup we ever use! Its easy to make chai flavored drinks with this syrup, mixes with milk easily, much better than having to dissolve powder. Minus one star because its pricy. Probably one of the best chai teas. So easy to steam the milk and add the syrup. Not overly sweet. It also does not have too much of the chai spices either(cinnamon, etc.). We have tried all brands of chai concentrate and this one is the most liked by the customers, It is also the easiest and most economical one to make! Defin. buy it!